(Nanowerk News) The traditional tunnel and borer christening celebration today marked the start of construction of the tunnel system for the X-ray laser European XFEL. More than 500 guests attended the ceremony on the building site in Schenefeld (Pinneberg district, Schleswig-Holstein), the future research campus of the X-ray laser facility. Tomorrow, the first of the two tunnel boring machines – TULA ("TUnnel for LAser"), 6.17 metres in diameter, 71 metres long, weighing 550 tonnes and costing 18 million Euros – will start in the direction of DESY-Bahrenfeld (Hamburg), where it will arrive in summer 2011. Godmother for the tunnels excavated by TULA and by the same token "earthly patron saint" for the tunnel builders is Dr. Herlind Gundelach, State Minister for Science and Research of the Free and Hanseatic City of Hamburg. 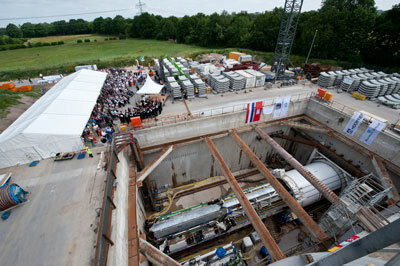 First tunnel and borer christening ceremony on the European XFEL construction site Schenefeld on 30 June 2010. In the foreground the tunnel boring machine in its start shaft. The new X-ray laser research facility is 3.4 kilometres long and located in the German federal states of Hamburg and Schleswig-Holstein. Its tunnel system comprises a 2.1-kilometre-long section for the electron accelerator and a "fan" of five tunnel sections in which the X-ray flashes used for research will be generated. These tunnels end in an underground experiment hall. In total, 5777 meters of tunnel will be constructed in the next two years using two boring machines, the larger of which now starts excavating the tunnel sections underneath the city of Hamburg. The two federal states of Hamburg and Schleswig-Holstein contribute a total of 90 million Euro to Germany's share of the costs for the X-ray laser facility. For Hamburg's State Minister for Science, Dr. Herlind Gundelach, this is a good investment: "The European XFEL is one of the largest construction projects for science and a research instrument that will be unique in its kind in the world. We expect it to generate important impetus for research for the whole area. Scientists from all over the world are already preparing themselves intensively to make use of the X-ray laser, and they look forward to many new insights in their disciplines." Schleswig-Holstein's Secretary of State for Science, Dr. Cordelia Andreßen, added: "The new X-ray laser not only links different countries in their common endeavour for science. Above all, it joins the two federal states of Hamburg and Schleswig-Holstein, not only at the political and financial level, but also quite really by means of the tunnel we have christened today. We in Schleswig-Holstein are proud to be part of this ambitious international large-scale project." For the Chairman of the Management Board of the European XFEL GmbH, Professor Massimo Altarelli, today's tunnel celebration has a special significance: "For us, this tunnel celebration is a twofold milestone on the hopefully not too stony path of the European XFEL project. First of all, it marks of course the beginning of the tunnel construction. But it also centres on the new international research institution, which is currently establishing itself in Northern Germany and which will construct and operate the European XFEL. For the very first time, such a celebration is sailing under the flag of the European XFEL GmbH." Professor Helmut Dosch, the Chairman of the Board of Directors of the Deutsches Elektronen-Synchrotron DESY, compared the new X-ray laser to a "high-speed camera for the nanoworld" and emphasized DESY's achievements: "At DESY we are feverishly awaiting the completion of the tunnels, because this will give the starting signal for the construction of the superconducting electron accelerator under the direction of the DESY accelerator experts. The accelerator relies on a technology promoted by DESY, which has passed its baptism by fire with flying colours at our free-electron laser FLASH and will give this European research project an invaluable advantage in the international competition." Dr. Georg Schütte, State Secretary at the Federal Ministry of Education and Research, declared on the occasion: "Using the European XFEL, scientists will soon be able to better understand how the nanoworld is working. In addition, today's basic research allows us to pave the way for tomorrow's innovations, like the materials and medicines of the future. To make this possible, the German federal government is increasingly investing in education and research, especially in times of economic crisis. In this legislative period, we are spending an additional 12 billion Euro for education and research, 6 billion of which are intended for research. This of course also strongly benefits basic research." Like mining, the tunnel construction for the European XFEL is subject to a special tradition that still plays an important role for miners and tunnel builders. The main item on the agenda for today's tunnel celebration was therefore the christening of the tunnel and tunnel boring machine, which traditionally takes place in an oecumenical service before the beginning of construction. The ceremony was accompanied in proper style by the miners' choir "Ruhrkohle-Chor" from Herne. It also featured the blessing of a wooden statue of Saint Barbara, which was then put up in a shrine on the tunnel wall. Saint Barbara is the patron saint of the miners and tunnel builders and is said to protect the workers from the dangers connected with their labour. The godparenthood for the first tunnels was assumed by Dr. Herlind Gundelach, State Minister for Science and Research of the Free and Hanseatic City of Hamburg. As tunnel godmother, she is regarded by the workers as the earthly representative of Saint Barbara for the duration of the tunnel construction, and the tunnel traditionally bears her first name (Herlind tunnel). The tunnel boring machine was also christened before its first assignment. Its name – TULA, TUnnel for LAser – was determined in a public contest by a large Hamburg local paper and announced today at the christening ceremony. Godmother of the machine is Imke Gembalies, staff member of the European XFEL GmbH. The tunnels of the European XFEL are located so deep that they run in the ground water. They are excavated directly underground using large tunnel boring machines. This well-proven method is used throughout the world for the construction of road and railway tunnels, for instance. The tunnels of the European X-ray laser have different diameters. Whereas the inner diameter of the accelerator tunnel is 5.30 metres, most of the sections of the tunnel fan have an inner diameter of 4.60 metres. They will therefore be constructed in sections by two tunnel boring machines of different size. Tunnel construction will last from July 2010 to summer 2012. Today's tunnel celebration marks the start of the larger machine. The smaller one will begin boring at the end of this year. With the X-ray laser European XFEL (X stand for X-ray, FEL for free-electron laser), Hamburg and Schleswig-Holstein will boast a unique research facility that will open up novel research opportunities for the natural sciences and industrial users starting in 2015. The main part of the 3.4-kilometre-long facility is located up to 38 metres deep in underground tunnels. The facility requires a total of 5.8 kilometres of tunnel, which can be accessed on three sites. The main tunnel for the superconducting particle accelerator, which brings electrons to the required energy, runs absolutely straight between the sites DESY-Bahrenfeld and Osdorfer Born. The particles are then distributed into a fan-shaped tunnel system located beneath the research campus Schenefeld, in which they generate intense X-ray flashes by flying through special arrangements of magnets. These are then led into an experiment hall, where international teams of scientists use the brilliant X-ray light for research. As the only research facility of this kind in the world, the European XFEL will produce high-intensity ultra-short X-ray flashes with the properties of laser light 27 000 times per second. This new light source will open up a whole range of new research perspectives for the natural sciences. The results will benefit a wide range of disciplines as well as industrial users – for instance for the development of new materials in the nanoworld or more effective medicines. As an international project, the European XFEL is operated by an independent research organisation, the non-profit European XFEL GmbH. This limited liability company was founded under German law in November 2009 and already employs a staff of almost 60 people. A total of 12 countries are currently participating in the project (Denmark, France, Germany, Greece, Hungary, Italy, Poland, Russia, Slovakia, Spain, Sweden and Switzerland). China is planning to participate. The present shareholders of the European XFEL GmbH are Denmark, Germany, Hungary, Russia, Slovakia, Sweden and Switzerland; China, France, Greece, Italy, Poland and Spain are planning to join the company. The construction costs for the facility including the commissioning amount to 1082 million Euro (price levels of 2005). As the host country, Germany (Federal government, Hamburg and Schleswig-Holstein) covers 54 percent of the construction costs. Russia takes over 23 percent and the other international partners between 1 and 3.5 percent each. Representative of Germany and main shareholder of the company with a share of more than 50 percent is the research centre DESY, where the concept of the X-ray laser facility was initiated and developed. DESY is the awarding authority for the civil and underground engineering work that started in January 2009. The European XFEL GmbH und DESY cooperate closely on the construction, commissioning and operation of the X-ray laser facility. Together with international partners, DESY is constructing the heart of the facility – the 1.7-kilometre-long superconducting accelerator including the electron source. After its completion, DESY will take over the operation of the accelerator on behalf of the European XFEL GmbH.